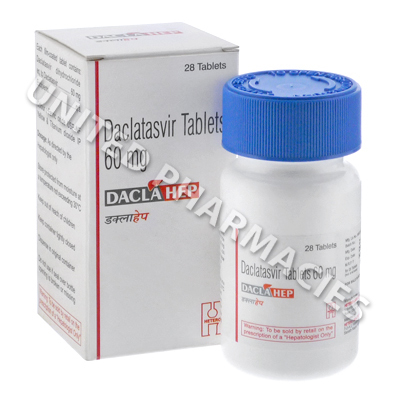 Daclahep (Daclatasvir Dihydrochloride) is used alongside sofosbuvir and/or ribavirin to treat chronic hepatitis C virus (HCV) genotype 1 or genotype 3 infection. The recommended dosage in most people is one 60mg tablet taken each day for a period of 12 weeks. The most common side effects encountered when taking Daclatasvir and Sofosbuvir are headache, fatigue, nausea and diarrhea. When Ribavirin is also taken, patients have also reported anemia, rash, insomnia, dizziness and somnolence as side effects. Patients who are taking Amiodarone with Daclahep and Sofosbuvir may experience serious symptomatic bradycardia, especially if they are taking beta-blockers or have heart problems or liver disease. Daclatasvir is should not be taken alongside when taking strong inducers of CYP3A such as phenytoin, carbamazepine, rifampin, and St. John’s wort. Safety of Daclatasvir in patients under 18 years has not been established.